During the 2016 campaign Donald Trump campaigned vigorously on "a Trump administration will stop the jobs from leaving America." Instead, US jobs are being outsourced at a record pace and the news is not good for American workers. On December 22, 2017, President Trump signed into law the Tax Cuts and Jobs Act (TCJA), a congressional revenue bill that amended the Internal Revenue code of 1986. One of the major elements of the law included cutting the corporate tax rate from 35% to 21%, pitched by Republicans as an incentive to companies to invest more in the United States and their workers. However, the Act also changed the United States from a global to a territorial tax system with respect to corporate income tax. Instead of a corporation paying the US tax rate for income earned in any country, it pays the lower rate of the country in which the subsidiary is legally established. Accordingly, the act not only dissuades domestic investment but, instead, creates new incentives for companies to avoid taxes by shifting profits, jobs, and operations overseas. Job outsourcing is when U.S. companies hire foreign workers instead of Americans, most frequently in the technology, call center, human resources, and manufacturing industries. The end result is an increase in US unemployment and loss of jobs. The first tax filings for multinational corporations under the new law prove as much. According to a review by the Institute on Taxation and Economic Policy (ITEP), big tech companies are taking advantage of the tax loopholes. Netflix and Amazon paid no U.S. federal income tax on record profits in 2018. These corporations are not alone. Since the "Tax Cut and Jobs Act" was signed into law, companies such as Harley-Davidson, Electrolux, Siemens, UTC and Schneider Electric have announced plant closures due to outsourcing. According to Public Citizen, in the manufacturing industry alone, incentives to offshore jobs have contributed to the net loss of nearly 50,000 American manufacturing facilities and nearly 4.5 million U.S. jobs. 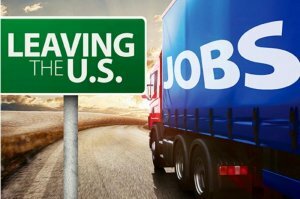 The U.S. Department of Labor lists more than 3 million workers as specifically losing their jobs to outsourcing and competition from imported goods - and that is under just one narrow program that excludes many people whose job loss is trade-related. Under President Trump, companies are offshoring jobs at an unprecedented level, including many that received huge government contracts. According to employment data charted by Good Jobs Nation, many of the companies responsible for offshoring jobs received huge government contracts. Federal contractors alone outsourced 10,269 jobs while taking over $19 billion in government money. 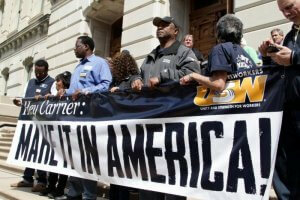 Never before in US history have federal contractors sent so many jobs overseas. 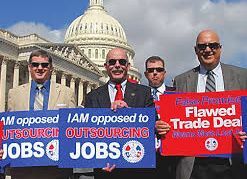 "This epidemic of these corporations taking our tax dollars one day and handing us pink slips the next must end," said International Association of Machinists International President Robert Martinez Jr. "Too many of our members and their communities have been left behind by a system that puts profits before people." The "No Tax Breaks for Outsourcing Act" (S. 780/H.R. 1711) would provide a simple, straightforward fix. 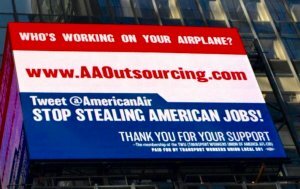 Introduced by Senator Sheldon Whitehouse (D-RI) and Representative Lloyd Doggett (D-TX), the "No Tax Breaks for Outsourcing Act" would level the playing field for small and wholly domestic businesses by eliminating the deep discount that multinational companies get for shifting profits offshore and outsourcing jobs. * Treat "foreign" corporations that are managed and controlled in the U.S. as domestic corporations. It's time to fight for a more fair tax system that focuses on job creation at home. Take Action: Ask your Senators and Representatives to co-sponsor the No Tax Breaks for Outsourcing Act. Because we need to still laugh. There is no shortage of material!